If you follow me on Twitter, you may have seen Banjo Cat on Redbubble. He is the newest addition to my works there, a weathered old cat who can sure play the banjo and who always has a full audience of forest friends. The piece is painted in watercolor, aside from a few instances of white pen, and gave me a lot of new insight into painting techniques. So, this is not exactly Watercolor Techniques #3, but it will follow in the same footsteps as that series. Watercolor log with various tones of same brown color. 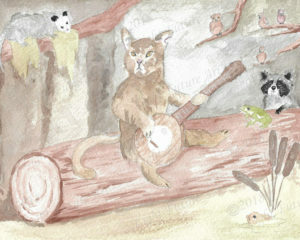 The first tip has to do with the painting of the log Banjo Cat is siting on. I used the same brown for every aspect of the log because keeping a common color brings the whole piece together to seem cohesive. I applied this same idea throughout most of the elements of the painting. The animals are contrasted against the background while also possessing many of the same colors as the background. For the log, as always, begin with the lightest dilution you plan on using. 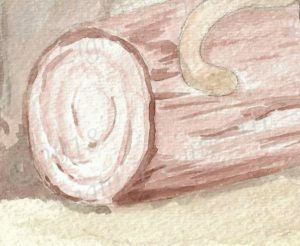 I didn’t paint the entire log that color because I knew there were some areas I wanted left white (those are the brightest areas receiving the most sunlight from above) and there were some areas I knew would be darker. That first coat didn’t add any definition to the wood, though, so I went in and started adding the detail with a darker dilution of the same brown. I did mix in a darker shade with the same base brown color for the shadows such as the place under the areas of wood casting the shadow because the light source is shining from above. This however doesn’t seem out of place because of that common color throughout all aspects of the log. The same idea is applied to the water and the background. The water is swampy and so is green, and the background carries that same green element to it. The water and deep background comprise about 50% of the piece and so unity and harmony between the two is essential for the piece to not feel disjointed. The banjo displays the instrument’s detail. The second tip has more to do with sketching and planning than it has to do with painting. I didn’t leave a lot of detail on the planning I laid out on the paper I actually completed the painting on. And I left the lines very loose and light. Most of the details were determined by me with the paint itself as I worked off of my reference images and practice. A good example is the banjo. While it is probably one of the most detailed elements of the painting, the actual pencil that I laid down was very scant. It was only the outline of the banjo shape. Leaving the pencil minimal under the paint brightens the piece and makes the appearance more natural. With darker colors, this won’t matter so much because the blacks and dark browns will cover the graphite but, especially in areas with white or very light colors, reducing the sketch to the bare minimum is worth it. To conclude, I will answer the question which I have been getting a lot about this piece, frankly more than I expected. Why? 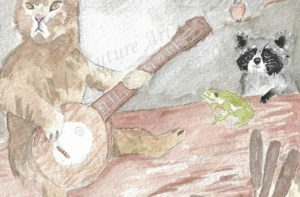 Why paint a Banjo Cat? What part of your imagination did that come from? I can’t answer that last question but as to the first, because he’s a cat playing the banjo. There are several cats in our neighborhood and one day, after seeing one, the idea just came into my mind that there could be a Banjo Cat and it stuck with me. I wanted to do something less serious for the holidays, a break from the work I put on Zazzle, which is more realistic portraits of animals. I doubt you would ever come across this scene in real life. But it was a fun idea and it taught me some important things about painting (and about opossums) and so it was well worth my time and lots of fun to paint. Thank you for reading. If you have a suggestion or a comment, please leave them below. There’s a new blog post every Tuesday and Friday, so I hope to see you again at the end of the week! Until then, goodbye! This post contains affiliate links meaning that we earn a referral from your purchase. Thank you for your support.